On May 16, 1866, the United States congress authorized the elimination of the “half-dime” coin and the minting of a new 5 cent piece, the “nickel.” From 1913 to 1938 the nickel bore the image of a Native American man’s head on the front and a buffalo on the back. Native American images have appeared throughout the history of the US in numerous cultural references. Here we list 10 of those iconic images, not all of which are considered flattering by Native Americans, and some are actually hated stereotypes. Insulting or honoring, these images, like Native Americans, are part of our cultural heritage. What images would you include? Redman was the first nationwide brand US Company to use a Native American logo, depicting a chief in full headdress. The Redman logo can be considered the “father” of all the other logo’s used in advertising depicting the image of a Native American. This team takes more heat for its name rather than its logo of the silhouette of a warrior’s head in a circle adorned by 2 feathers, but the prominence of the Redskins as the team representing our nation’s capital makes this image an extremely common one. 8. Iron Eyes Cody, The Crying Indian. Born Espera Oscar de Corti in Louisiana in 1904, Iron Eyes was an Italian American and not even of Native American ancestry; however, he became the face of a 1971 anti-litter television, billboard and poster campaign as a sad Native American with a tear trickling from his eye as he looks at litter spoiling a pastoral scene. Cody was an actor and appeared in many motion pictures and television programs, always depicting a Native American. Cody also pretended to be a Native American in real life and supported Native American causes despite being an imposter. Cracked fact: Cody can be heard chanting on the Joni Mitchell record, Lakota. Produced from 1859 to 1909, the so called Indian Head Cent bears the image of a Native American head viewed from the side and wearing a full feathered headdress. Legend says the designer used his daughter (non-Native American) for the likeness, but in reality he said the image used as a model was that of a statue of Venus. (Seriously, how hard could it have been to find a Native American model in 1859?) This coin was issued at a time where a penny was an important piece of currency and the image remained familiar to Americans for many years. 6. Cigar Store Wooden Indian. These carved wooden statues, sometimes larger than life, were first used by tobacconists in Europe as a graphic symbol of the products they sold since many people were illiterate. Since Native Americans first introduced Europeans to tobacco, the image of a Native American was associated with tobacco, and American tobacco shops continued the tradition. Cracked fact: Since Europeans (other than American settlers) had no first hand knowledge of Native Americans the early “Wooden Indians” were made in the image of African slaves. The face of this extremely photogenic chief stares at us through the ages reflecting the heavy burden of wisdom and sorrow in his craggy countenance. 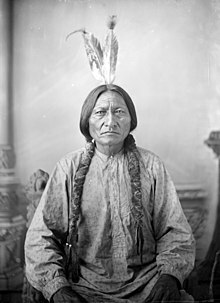 He was photographed often enough so that his photograph of a real life legend is much more than a cartoon caricature or artist’s impression of what a Native American should look like. More of a Holy Man and Elder than a warrior, this Hunkpapa Lakota is perhaps the most recognizable Native American. Something is extra special about having your image on the main monetary denomination of a country, and the image of this intrepid woman who guided the Lewis and Clark expedition pays homage to the fact that this great expedition would not have succeeded without her. Depicted carrying her baby, there is no known image of the real life Sacagawea and the model for the coin was Randy’L He-Dow Teton, a Native American woman born in 1976. 3. Chief Wahoo, Cleveland Indians. The Indians were supposedly named in honor of Native American teammate on the Cleveland Spiders, Louis Sockalexis. Louis is known as the first Native American to play major league baseball, although there is some conflict about who should actually be considered “first” due to mixed heritage of the contenders. The smiling, hook nosed Chief Wahoo logo first made its appearance in 1946 and has been insulting Native Americans ever since. Seen as a racial caricature and demeaning, even Louis Sockalexis expressed disgust at the cartoon image. Law suits, protests, condemnation by religious and civic groups have not yet convinced “Tribe” owners to ditch the offensive logo. Note: The Atlanta Braves replaced the Chief Noc-A-Homa logo with a tomahawk. Can the Indians do something like that? 2. Sculpture of Crazy Horse. Located in the sacred Black Hills of South Dakota on Thunderhead Mountain, this sculpture of the great Chief Crazy Horse is still under construction and will be the largest sculpture in the world when completed. Commissioned by Henry Standing Bear and designed by Korczak Ziolkowski, the depiction of the famous Oglala Lakota warrior will be 641 feet long and 563 feet high. The head of Crazy Horse will be almost one and a half times taller than those on Mt. Rushmore. Under construction since 1948, the giant face of Crazy Horse is complete, but most of the rest of the statue is not. Still, the face is impressive and the monument is open as The Crazy Horse Memorial with a museum and cultural center on the grounds. 1. The “Indian Head” Nickel. Although the US mint says the image is not of any particular person, the image being a composite of several different people, a few Native Americans have claimed to be the model for the serious and determined looking visage. Notable claimant as the model was John Big Tree (Seneca) who frequently appeared in public appearances billed as the “Nickel Indian.” (He died in 1967.) No buffalo (bison) ever tried to profit from claiming to be the model for the reverse side of the nickel! Bataille, Gretchen M. Native American Representations: First Encounters, Distorted Images, and Literary Appropriations. University of Nebraska Press, 2001.